A truly beautiful designer wedding dress from the Pronovias Onija Collection. A flattering A-line dress with gorgeous deep V neck both front and back and made from petit pois tulle with guipure appliqués and crystal gemstone embroidery as well as degradé appliqués on the skirt and hem. 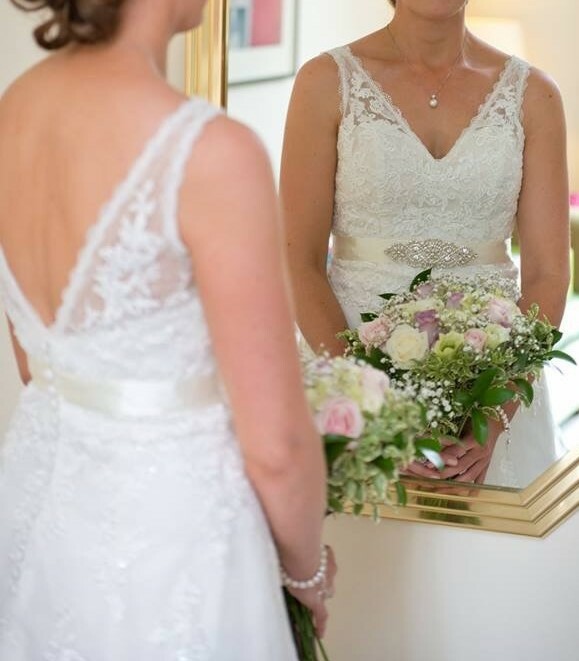 You can see from the pictures that I added a beautiful Vintage Diamante belt to match my chosen jewellery and to make the gown truly one of a kind. Size 12 with minor fitting adjustment. The dress has been professionally dry cleaned and carefully packaged so it remains in perfect condition. Minor take in on but and waist.